The subject of England goalkeepers is perhaps the most taxing one for Gareth Southgate, with the 2018 World Cup Finals now only three months away. On Thursday he names his latest squad for the friendlies against Italy and Holland. This is the last squad to be named before the end of the league season and the main focus for Newcastle fans will be whether Jamaal Lascelles manages to sneak in, thanks to some outstanding form this season. Excellent once again against Southampton on Saturday, you have to feel that on form he definitely deserves to be considered. The England goalkeepers situation is a bit of a mess. Hart’s continuing struggles have raised questions over his suitability to be England’s No 1 in Russia, but many of England’s other goalkeepers have also struggled to impress in recent months. The three big favourites with the bookies to go to Russia are Pickford (1/10), Butland (1/8) and Hart (1/3). Pickford has been indifferent this season and despite Everton being ninth in the Premier League, only four clubs have conceded more than the 49 Pickford has leaked. As for Jack Butland, Stoke have conceded 54 this season, only West Ham more disastrous with 57. Speaking of which, Joe Hart hasn’t even been getting a game but was brought back after four months on the bench and let in another howler on Saturday. The next three in the betting to be named in the squad for Russia are Pope (7/4), Heaton (7/2) and Forster (12/1). Fraser Forster can’t get a game for Southampton and Heaton is the same with Burnley. Surely this is an occasion when the most in-form goalkeeper has to be picked. Nick Pope has taken his chance with both hands when Heaton got injured and in 26 starts has conceded only 22 Premier League goals. Only the top three clubs (Man U, Man City, Spurs) have conceded fewer goals than Burnley. As you can see, Pope’s save percentage is a country mile ahead of the rest, with surprisingly Newcastle’s Karl Darlow second highest. The NUFC keeper was actually in very good form when getting back in ahead of Elliot and could count himself unfortunate to lose his place BUT nobody would deny it wasn’t the right one, with the form of Martin Dubravka excellent so far. In his last seven matches for Newcastle, Darlow conceded three goals at Manchester City but only four in the other six games. 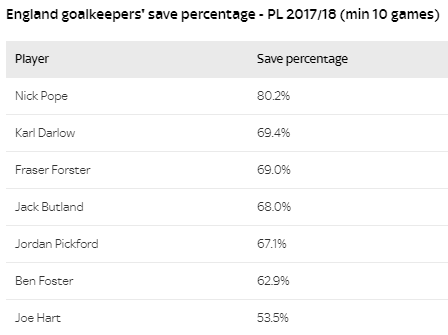 ‘Pickford’s save percentage is down at 67.1 per cent. He helped Everton keep a clean sheet against Brighton on Saturday but was culpable for both Burnley goals in their recent 2-1 win over the Toffees, while Butland has returned to full fitness but a glaring error against Leicester undid much of his good work last week. This time last year, few would have picked out Burnley’s back-up goalkeeper Nick Pope as a potential World Cup call-up but the former Charlton man has excelled since stepping in for the injured Tom Heaton. Pope has the best save percentage – 80.2 per cent – of any English goalkeeper in the Premier League, has not made a single error leading to a shot or goal, according to Opta, and has starred in some of Burnley’s biggest results of the season.